Last week, I visited Kathy Ahoy, a Public Health Nurse, at the Street Level Health Project. 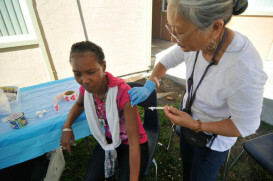 Based in East Oakland, SLHP was founded in 2002 to address the health issues of Oakland’s large immigrant population. In its ten years of existence, the grassroots community center has worked tirelessly to tackle health disparities and improve the quality of life for underserved urban immigrant communities in the Bay Area. They have done so through a food program and a health clinic which offers free health screenings and referrals. The day I visited, their food program was up and running. The purpose of my visit was to see what Kathy was up to; I occasionally drop by to check on the outstanding work she is doing. That particular day, Kathy was passing out vegetables so I jumped in to join her. The distribution space was incredibly small and the entire operation resembled a beehive activity, with Kathy and the rest of the SLHP team working in tight quarters to serve their community. Approximately 60% of the people that received vegetables that day were immigrant women, a largely underserved population. Recently, a donor working with PVF gave SLHP $10,000 to help expand SLHP’s services for women. With this money, they are able to increase the number of days of drop-in medical services for women from two to three days. These services will begin January 2013. Kathy Ahoy, who emigrated from India, is a Public Health Nurse of Alameda County and co-founder of Street Level Health Project. PVF has been following and supporting both Kathy and SLHP from the beginning, and it has been wonderful to witness the evolution and growth of the organization. Kathy is now about to retire, but we don’t want to lose this remarkable individual. She is one of PVF’s community level informants and has been instrumental over the years in helping PVF stay connected with the community. It is very important to me and my team at PVF that we continue to work with Kathy in some form. So, what next? This entry was posted in Uncategorized and tagged health, immigrants, Oakland, poverty, Where's Bill. Bookmark the permalink.